In a survival situation there are dozens of ways to cook outdoors without power. Solar ovens, clay ovens and open fire cooking are just a few; there are many more. But what happens when the grid is down and you need to stay indoors? Anything from a hurricane or extreme cold snap, to a longer-term emergency like a pandemic or nuclear fallout situation, can force you to do your cooking inside. Most long-term storage preparedness foods, like white rice and beans, require cooking. How do you feed your family, while at the same time keeping them safe indoors? Electric stoves are more common these days, and propane stoves are even banned in many apartment complexes. But if you happen to have a propane stove, you don’t need electricity to cook. Even propane stoves with a built-in electronic igniter can be lit with a match or your trusty Zippo. Most domestic propane stoves have a fume hood that helps dissipate toxic fumes or gases produced during cooking. Many families don’t bother to use them. Growing up, ours never worked, and our house was naturally well ventilated enough that it never mattered. In a major crisis hoods with a powered extractor fan probably won’t be working anyway. Keep in mind that any stove that’s burning fuel needs a good air supply. If there isn’t enough oxygen in the air the fuel won’t burn properly, and that releases deadly carbon monoxide gas. Always use stoves in an area that has good ventilation. This can be a problem if there’s a fallout hazard, so when you’re preparing fallout rooms or shelters make sure there’s a good, properly filtered air intake in a location that will let you cook safely. We often forget that electricity is a relatively recent invention, and that our ancestors cooked in fireplaces and on wood stoves for centuries. A Dutch oven is just that – an oven. 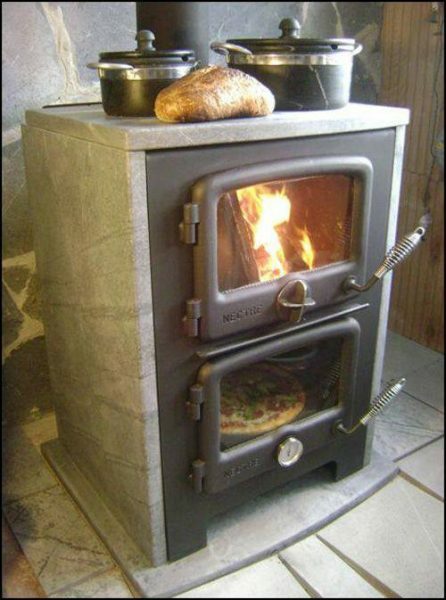 It can be used to bake cookies on a wood stove, trapping the heat inside the cast iron and creating an oven from just about any heat source. While most people no longer have the equipment at hand to simmer a stew hung over their fireplace, it’s easy enough to bend a wire coat hanger into a skewer and cook simple foods over the fire. If you have an old fireplace with cooking hardware like a spit, grill or swing trivet, overhaul it and get it into working order. If you don’t have these items, look at installing them. Wrapping food in aluminum foil in the fireplace or wood stove is also a good option. 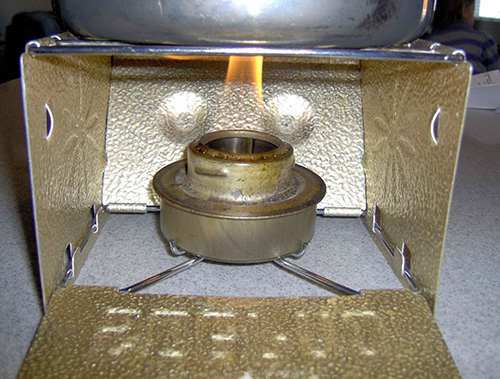 Small camp stoves that burn denatured alcohol can be used indoors. The denatured alcohol used in these stoves burns clean and should be safe to use indoors. 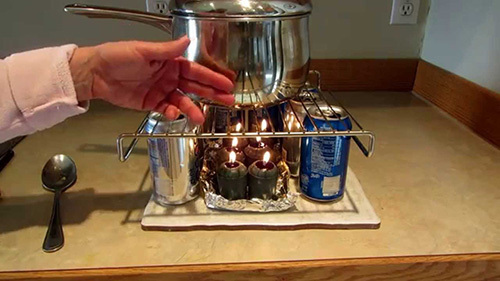 You can make your own stove out of a soda can and a little ingenuity, or they’re readily available from camp stove retailers. Often used to heat food indoors on buffet tables, “canned heat” is sold under the brand name Sterno. 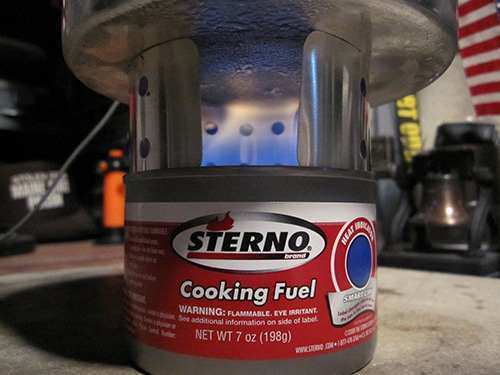 Sterno cans contain an alcohol-based fuel that burns cleanly, and individual canisters can burn for up to two hours for continuous heating. Since they’re designed to burn mostly unattended for the entire duration of an event, they’re a good option for slowly simmering a small pot of stew or beans. Keep in mind that each canister is small and can only heat a small pot. If you have a larger pot, use 4 or 5 of the heat cans to bring it up to temperature and keep the lid on to retain heat. The main benefits of canned heat are that it’s specifically designed for use indoors for heating and cooking food. They can safely be used just about anywhere, assuming you have a stable surface that won’t tip over. They’re easy to store, portable, and a great all-around solution for indoor cooking. Cooking over a candle is not a lot different from cooking over a Sterno canned heat canister. All you need is the ability to suspend the food over the heat source. Larger candles with multiple wicks might be a better choice if you’re trying to boil water. Choose a candle that burns relatively cleanly, like all-natural beeswax candles. Avoid scented, heavily synthetic or dyed candles. The more “stuff” that is in a candle besides the wax fuel, the worse it will be for indoor air pollution when you’re cooking in an emergency. Inside MREs there’s a chemical heat packet that can be used to warm food. For example, an MRE might include a vacuum-sealed shelf-stable chicken breast, and along with it there would be a heating pouch that uses a chemical reaction to warm the food. It works like snap activated hand warmer packets. While I wouldn’t feel safe putting hand warmer packets directly into my food, I would wrap a can of spaghetti-O’s in hand warmers and have a reasonably hot meal in minutes. One manufacturer, called Magic Cook, makes a flameless stove that uses a water-based chemical reaction to create heat to cook food. Simply add water to the heat pack to generate sustained heat for 15 to 20 minutes to warm food. A big advantage of chemical stoves like this is they don’t release carbon monoxide – but some kinds may release flammable hydrogen, so be careful. Once you’re done cooking, the heat pack has absorbed the water and the reaction is complete. The heat pack can be disposed of in a normal household trash can. 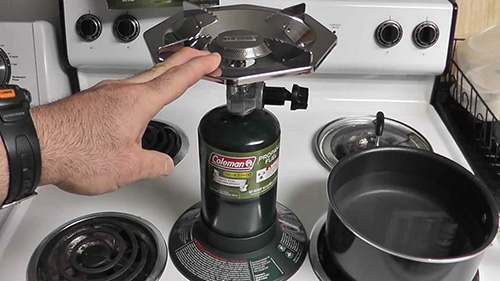 This type of flameless stove is convenient to have on hand for a few uses while the power’s out, but since it requires expensive specialized heat packets, it’s not a good choice for the long term. That said, most emergencies are day to day emergencies, where the power is out for a day or less. So while you may not have electricity in your house, your car’s battery is full of juice. There’s one manufacturer that makes a small heating element that plugs into a cars cigarette lighter. Keep in mind that this will kill your car battery quickly, and you shouldn’t turn on your car’s engine while it’s in the garage. 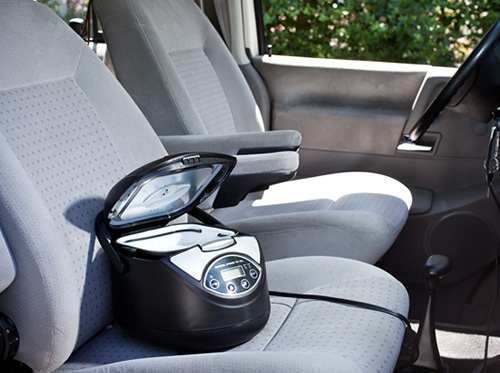 Car lighter stoves are best used in situations where you can actually run the car. If you’re on the road during an emergency, and you need an “indoor” way to cook inside your car for any reason, this is a reasonable option. Something that needs to cook a long time can be done by using a thermos bottle. I have already experimented with that and wrote about the topic many posts ago. You will have to experiment on how much rice and water to use. In my opinion, it is necessary to use a wide mouth thermos. I have a 20 oz stainless steel Stanley thermos that I use to cook rice and macaroni and oatmeal with. You can also use it to make hard boiled eggs. I cook the oatmeal overnight, making it just before I go to bed. I pout hot water in the thermos first to heat it. After the thermos is heated I put in the amount of food I want to cook. I then fill the thermos to the top with boiling water and close it up. With oatmeal I just leave it overnight. It is still plenty hot in the morning and ready to eat. I don’t remember how long I cooked the rice, it was several hours. You have to watch the time with pasta as it will get soggy but still edible if you leave it in the hot water too long. You can cook meat, vegetables and all manner of food. I haven’t experimented with cooking beans via thermos bottle but I am sure with some experimentation, I could manage to cook a variety of beans. My original purpose was to see if I could cook food, (1) without generating a lot of food odors to advertise that I was cooking. The thermos method of cooking works quite well in that regard. (2) to see if I could cook food while on the move. The thermos cooking method is outstanding in that regard. It is also the method I would employ if I didn’t have electricity or a small propane stove. Not if you use Stereo or an alcohol lamp to heat the water. In any event, I suspect in an EOTW situation, there will be so much smoke in the air one will not be able to tell where the smoke is coming from. I can attest in the recent SoCal fires, with so much smoke in the air it would have been impossible to detect where a small wood fire was located. After the fire was past, if there was a fresh batch of smoke in the air everyone was quite concerned about the direction of the wind and the source of the smoke. In all those instances the fire was miles away, but a slight shift in the wind would move the smoke plume but without a major effort involving many miles of searching, locating the exact source of that smoke would have been impossible, especially if one were on foot. Obviously, if you have a huge fire and are burning green wood and are the only fire around, your location is going to be detectable. but a small, relatively smokeless fire such as that in a rocket stove or a Dakota fire pit, will go undetectable and most likely unnoticed. In an EOTW scenario, fire is going to be our best friend and our greatest enemy. There will be no fire department to respond to an out of control fire and there will be no back up fire departments to assist in an out of control fire. In the SoCal fires last December there were fire departments responding from as far away as near the Oregon border. We evacuated to the San Francisco area where we had relatives living and passed many convoys of fire trucks heading to the Thomas Fire down Highway 101 and I am sure the same was true on I-5. That won’t happen if the balloon bursts. Many folks just aren’t used to open flame. Indeed, I believe a large portion of barbecue kettles today are propane fired. Folks just don’t mess with lighting charcoal any more. Both of my children have barbecues and they both are propane fired. The first time my son went camping with his children he had trouble lighting the campfire. In order to get it going he poured a small amount of Coleman white gas on what he thought was a dead fire. It wasn’t quite dead. He won’t do that again in a hurry. Luckily no one was injured, just scared badly. Fortunately, he only poured a small amount of gas on the fire from a steel cup. Had he poured it directly from the can the results would have been a disaster. He had been camping with us many times as a child and I thought he knew better. but it was about twenty years since he had been camping and even though I always had him and his sister lay the fire when we were camping, I guess he forgot how. Just think how many folks are going to be lighting fires who have never even barbecued. Once a house catches fire in a suburban tract, there is a good chance, with no water flowing that the whole tract will burn at least to an intersecting street. Something else about smokeless wood fires, I see very few people that can do it. A fire needs 3 things, fuel, oxygen, and heat. What heat means is that the fuel needs to get hot enough to ignite. This is why you cant start a log on fire with a match. You have to start with small fuel like kindling that heat up faster. As the wood heats up, the wood releases gasses and it smokes. When it’s hot enough, the gasses and smoke will burn up then it burns clean. So the faster it heats up, the faster it will burn. You don’t need to make a big fire to get it hot enough, it’s rare my fires have flames reaching up to 2 ft. The highest my flames get is when I first start it. Always use dry fuel, it’s a lot harder to get damp fuel to heat up. If you keep building up the heat (you don’t need tall flame) you can burn logs, just keep feeding the heat with smaller fuel placed in strategic places to keep the heat up. If you do it right, you will have strong heat, low flame, no smoke and gasses, it’s clean. Some wood like pine pops so if you need to be quiet, don’t use it. It is not smoke that I worry about, it is CO. Great care must be used when heating or cooking inside with out a chimney. As the author of this article pointed out, cook on your stove. Most stoves these days have a hood that exits to the outside. You don’t have to open a window wide open, just cracking it an inch or two will provide enough air flow to prevent CO poisoning. There is a formula that provides exact data on how much air flow a certain size room requires. I don’t know where I viewed it but the air flow is fairly minimal. I was surprised at how little it was. You can probably find it if you search on line. When I first went to Japan in the mid 50s, the Japanese still used charcoal for cooking and heating. They were too poor to even afford kerosene heaters. The charcoal was in the form of a block about the size of a 3 pound coffee can. it had multiple holes in it running from top to bottom to allow it to burn cleanly. It was used in the kitchen for cooking and in the evenings it was put in the middle of a wooden frame covered with a quilt. The arrangement was called kotatsu. It was how one kept warm in an unheated Japanese house in the winter. One sat with their arms and legs under the quilt quite nicely heated by the charcoal brazier. At bedtime the charcoal brazier was put out in the kitchen to be used to start the charcoal in the morning for breakfast. The door to the kitchen was closed and everyone went to bed. While there were frequent CO deaths, especially among GIs who did not know how to handle the charcoal, millions of Japanese families used that method to survive some fairly cold winters for cooking and heating. Only the very wealthiest families could afford kerosene heaters. Charcoal braziers were everywhere in those days. One even saw them in rural government offices for heating the ubiquitous tea that was drunk to keep warm as much as anything else. Great points there, Chuck. The thing that really concerns me is cooking in a fallout room or bunker. A big part of preparing a fallout refuge is making sure outside air can’t flow in freely. In this scenario all air should be coming in through a filter system, and the challenge is to make sure the stove is getting enough to burn the fuel properly. Claude: I’m going to do an online search and see if I can find that website that has the formula for figuring out how much air flow you need to keep CO at bay. The favorite way to commit suicide in Japan presently is CO poisoning. There are even suicide groups that get together under a blue plastic tarp with a charcoal burner and commit suicide together. They meet up on line. I don’t know if it is mass hysteria or the power of group suggestion or what the driving force is. I am not alone, even Japanese psychologists and psychiatrists are at a loss to explain the phenomenon. left coast chuck, we’ve got kids eating laundry pods so who can explain anything anymore. Yes we do. I can just about understand not thinking preparedness is important, but actually eating household chemicals? I just don’t get the way some people think. At all. If you go to Amazon and search for konro grill, you will see examples of the charcoal braziers used in Japanese homes in the 50s and I am sure for many years prior to that. They are a lot niftier than the konro used in the 50s and a lot pricier now that they are yuppy items rather than every day household items. I researched konro which was the Japanese term for the charcoal brick that I described above. Wikipedia didn’t have anything. I am not even sure that younger Japanese know what konro is. I have found in recent travels to Japan that many older Japanese items are unknown by the younger generation. Sort of like the clerks in Home Depot not knowing what kerosene is. Simple answer: If you have a fireplace, you can pick up a couple of concrete blocks and insert into your fireplace in minutes. ROCKET STOVE. Lots of heat, no smoke.It does need to vent fumes out your fireplace. Many people are building rocket stove into their homes. I saw 30 loaves of bread cooked using a rocket stove with only a handful of twigs! You can also buy online a kerosene stove. It comes with an oven to place on top of the burner. A few five gallon cans of kerosene will last a whole lot longer than that two week period the fed says you must be prepared for. You can also use it in the lamps you can buy for less than $5.00. But dont forget, with all of this having been, its water you should be focusing on. Fill up your tub at the first sign of trouble before there is no more. Every milk jug you bring home from the store should be filled with water. You can have safe long term storage in gallon jugs by adding a teaspoon of Clorox. Leave the cap off for a day or so before using and the chlorine gas will dissipate. And get you some iodine tabs online, just in case its a nuke. Pretty cheap insurance. Silver: It is extremely difficult to get rid of the original contents of plastic jugs. I have 1-gallon apple juice jugs that I temporarily store water in. The newest one has been used at least ten times, yet when I fill it up with water if I am standing close to the opening to the jug I can still smell the apple juice smell coming out. While you may have a totally different take on the matter, I would not use milk jugs to store water I was going to drink. I would use them for washing clothes, perhaps bathing, certainly for flushing the toilet if it still works but I personally wouldn’t use it for drinking or cooking no matter what disinfectant I put in it. Milk jugs are also very handy to bring unclean water to the site where it is processed into clean water. I recently discovered that an acquaintance of mine, the father of an former employee kept every milk jug he ever bought, and I suspect he bought a lot as I recall he and his wife had seven kids, equally divided more or less between boys and girls. Even though he lived in city limits, originally his house was in the county and he was on a septic tank. Even time his family emptied a gallon milk jug it went in the back yard full of water. His theory was with that many people living in the house, he was going to need lots of water for flushing. His son-in-law told me when the older couple moved out he had to move hundreds of gallon milk jugs, some of which had disintegrated. The old man was a prepper long before it was popular. Okay, having spent the last hour searching various sites on the internet, I have been unable to find the spreadsheet like page that I saw at one time in the past. However, having looked at so many pages that recommended getting a CO detector, the solution to me seems incredibly simple. As part of your preparation for emergencies, you should acquire an additional CO detector to use in the room where you are cooking. I have my CO detectors in the bedrooms where I believed we would be most likely affected by CO from our furnace. It is a simple matter to buy an additional CO detector and put it into operation in the kitchen if the house is closed up and we are cooking over open flame. Cooking over small heat sources such a Sterno or an alcohol lamp should be easily handled by people going in and out of the house. If you are in a bomb shelter or some enclosed space, then I would strongly urge a CO detector no matter how you cook. That’s a solution that’s so obvious I never thought of it, so thanks for pointing it out! Yes, CO is so dangerous that detecting it is something we should prepare to do – and I’m going to add a couple of detectors to my list of essential fallout shelter equipment. 1) You should have more than one. If you are ina smaller are with an emergency exit, you would want to be sure the exit of choice has not already become untenable. Another reason is they are mass produced and can be faulty ( my recommendation is 2 (1) from different manufacturers). 2) Both detectors have relatively short lifespan 10 years on smoke detectors and 3-5 years ( depending on manufacturers). The good news on new models of stand alone( battery only) is the battery is non- replaceable but works for 10 years without having to remember extra batteries for life safety as well as everything else. CO detectors will need batteries and they use a different technology so “ storing “ spares will be not as easy. My recommendation is seal the entire package. One of the leading Manufacturers sells battery and sensor as one unit but the battery will continue to have storage drain ( think alkaline batteries). The sensors don’t always fail and sound an alarm like most smoke detectors will. Knowing it’s working is the key, but testing wears on the sensor. 3) Do Not rely on combination house current/battery for long term use. A full battery running a 110/battery detector will last 3-5 days only. During the last long power outage here most detectors lasted about 2-3 days. Battery only will last approximately 12 months. Folk who live in constrained spaces have a problem with smoke detectors; devices often sound during ANY sort of cooking. Detectors needed which can be turned off during cooking. And folk should do all fry-cooking and open-flame outdoors or in a separate structure than that in which they sleep and keep their valuables. In former times, wealthier people would have kitchens separated from their main houses. One thing you can do is make your own instant rice, now. It’s easy to make and there are instruction in the internet. As to something like beans, or soups, they are easy to can already cooked. Both things a lot cheaper than buying. All you need to do is warm them, easy enough with even a candle set-up. I have a small kerosene stove and oven, they just need some ventilation, which in my case works since I have an attached garage (rarely air tight). Kerosene is no even close to as risky as other types of liquid or gasses used for cooking and easy to store long term. Just a note about stereo. When we lost the power I was using a stereo camp stove to heat water and food. I had bought a no-name brand chafing dish fuel and there was a slight but nasty oily odor and a certain amount of residue in the can after the fuel burned out. It did the job for under $1 per can but I would recommend spending extra $$ for better quality. Sorry-it should have read “sterno”. Darn spell check! Don’t you just love predictive? I don’t mind owning up to my own errors which are frequent enough, but I hate to get tagged with errors because the computer has a limited vocabulary. Reminds me of some NCOs I knew in the service who only knew one adjective. I heat and do cook on my rocketstove,that happens to also have a gravity fed pellet hopper. I can heat and cook with twigs, chips from my chipper, or commercial pellets. Its bern a life saver to heat with and do part of my cooking on it. I alsp have an electronic ignition propane gas stove. Lights easy enough with a kitchen match or long lighter. Any baking I want to do is in a dutch oven or castiron frying pan with a castiron lid. No power for about 2 months now and we are warm and well fed. No complaints. When the power is finally restored to the well, that will be the relief. Hauling wqter from someone elses home has been a pain. I had just finished moving here when the “powerless scenario” began. I have barrels but no gutter yet to catch rain water. It will come. My grandmother said she’d bring her stew to a boil then bury it in a large box filled with hay. At the end of the day it was ready to eat and still warm. Sounds like an early model thermos bottle. Basically the same principle I use with my thermos bottle. I haven’t tried it, but I am pretty sure if I put small chunks of meat in the thermos with boiling water by the end of the day it would be cooked. If I were going to make stew with vegetables and meat, I would need a bigger wide mouth thermos. The 20 oz would make enough for one person — maybe two light eaters, but I think a 1 liter or quart bottle would be better. Straw also used in prior days to keep ice from quickly melting, so river and pond ice could be shipped remarkable distances by rail and vessel. What I do with eggs and pasta is bring the pot to a boil, cover it with top and a towel, and then wait a few minutes. Shorter time for pasta (like al dente), and longer for boiled eggs. No need to waste energy by boiling and boiling. Something everyone should know about is oil stoves they burn without smoke so long as you keep temperature up,they can be very efficient,they aren’t fussy on the quality of the oil,and they work very well,oil burns hot ,the hottest fire is oil and waters mix,but no need unless we go ice age cold,oil can be for free and readily right now but that would change so even before you make a burner start collecting your oil ,then look on YouTube for a how to vodeo,they are simple and cheap you can even just make the container and burn inside your regular log burner,,but in some kind of rotation wood burners lay on a layer of resin inside your flue pipe if you burn a lot of soft wood like pine,so I would be careful if that’s the case,,you can also wrap your burners flue pipe with copper tube in a spiral with a gap or well positioned pinched end and with a cold water tank raised higher than the stove you now have instant hot water.with some trial and error on height and flow.. I looked at a couple of the u-tube videos. First of all, one needs to have an old fashioned wood burning stove or coal burning stove to contain the oil burner. Oops. That’s a little awkward to have in the kitchen, especially with no chimney unless one is going to take out the ventilating fan and run the chimney up through the empty duct. Secondly, I don’t know about no smoke from an oil stove. In 1955 in Tent Camp 2, Camp Pendleton, we used kerosene heaters that operated a lot like the oil stove in the u-tube videos. I can tell you from spending several winter months in Tent Camp 2 that there was plenty of smoke and the odor of kerosene hung heavily in the air all night long. We also used them during the winter on Okinawa ’56 – ’58 in the Quonset huts with the same results. I don’t remember how much kerosene they used a night this many years later but I do remember filling up the 5 gallon gas can with kerosene on a very regular basis. In the two videos I watched the maker of the oil stove was in a semi-outdoor setting. It looked like it was a work shed. It definitely wasn’t in the kitchen of his house. I also looked up stoves on Wikipedia. There is an interesting number of primitive stoves used around the world. Wikipedia points out that most of the biomass stoves used around the world have significant drawbacks with regard to smoke and particulate matter and create health problems for the folks who use them. One stove that was mentioned in Wikipedia and I don’t know if it was a paid placement or not, but it is called Biolite. It is a fan assisted jet stove. It uses biomass for its fuel and uses a thermocouple to generate electricity to run the fan and a led light. 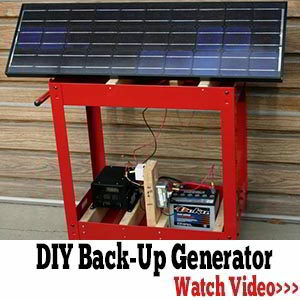 It can also charge your cell phone or other small electronic device. It has retailed for $130 at Lowe’s in the past. Once it is going, it is smokeless as it uses most of the fuel and leaves little ash. The fan makes it more efficient. I am sure it generates CO n the combustion process, however. I have never seen an ad for it where it was being used indoors. It was always an outdoor setting. If one has a gas stove, you can cook on the gas stove as long as the pressure remains on in the line. Also, if one has a gas connection to their fireplace, one could purchase a gas driven camping stove and use the gas line to feed it for as long as pressure remained in the line. You could open or close the chimney vent as needed. Resinous woods indeed a problem. Roaring chimney and stack fires once common. Not unknown for fire to shoot out in attic or roof thru mortar gaps, then things get very exciting. Chimney sweeps not a comedy profession; animals known to build blocking yet flammable nests in chimneys and stacks. Stacks may be used to heat water, but making a fire during Summer can be miserably hot. Propane or other gas on-demand water-heaters the best. For everyone else who has posted, I also must agree with Chuck on water storage. Every article I have ever read without exception does not recommend storing water for drinking in plastic jugs that are not specifically designed for doing so i.e. bph free etc. However, as someone mentioned, they make for great storage for water for bathing,cleaning and flushing, requirements that are often neglected when discussing prepping. As always, I so enjoy reading everyone’s posts. Have a blessed day! Chemical cookery methods: dispose chemical packets etc. into an outdoor metal garbage can, not into an under-cabinet trash bin. Live-aboard cruisers generally use propane or a like bottled gas. Have seen kerosene stoves and heating on vessels, but soot a problem. Also ugly stacks up thru deck. Hi Drying Racks, glad you are parousing the articles. Many goid articles and informative comments. Claude recently did a revue of the BaroCook Flameless Thermal Cooker. that uses quicklime for fuel. Neat idea but the heat packs are too pricey for long term. I can buy a 50lb. bag at the local building supply for $15.00 plus tax. For the price of 10 heat packs at $1.50 each you can cook 1120 times @ 20 grams per time, or 800 times if you use an ounce at the time.Be great for bugging in or prepositioning at a bugout location. the only reason I can see for little bags, besides parting us from our money, would be a bit easier clean up.If you clean up before dries it should not be a problem anyway. There is no toxic waste to dispose of as you have slaked lime when done, which can be tossed on the garden for a bit of calcium, or maybe patch a few nail holes in drywall! Also it is one chemical heat source with no worries about spontaneous combustion as it never reaches combustion temps and leaves nothing combustible behind. update; I finally had money to go pick up the quicklime today. Turns out what they had was household lime not quick. So, it’s back on the hunt! Was told to check out the ready-mix plant as they add quicklime to the concrete to help it set faster in cold weather. Hello … the camp stove and alcohol burner is a copyrighted photo that belongs to me. I’m sure you posted it by mistake. Please remove it from the post.